As much as I love to bake, there are days when I just don’t feel like doing the work. When pulling out the ingredients seems too bothersome and not one recipe in a stack of cookbooks seems worth the trouble. Just when I thought yesterday was going to be one of those days, I found this recipe in an old issue of Fine Cooking Magazine. Fine Cooking’s Espresso Tart pulled me out of my rut and changed my day. The ingredients were pretty easy to round up (except for the ground espresso, which I did have to pick up at the grocery store) and the technique for making it was super simple and didn’t require much focusing. The end result was company-worthy, elegant, and a perfect complement to end-of-season berries which I got on sale at the store where I bought the espresso. There was nothing about this recipe that needed changing. The only caveat is to make sure you’re serving this to people who like coffee because you can really taste the ground espresso beans. This isn’t one of those recipes where the coffee is an undertone. It’s more of a highlight! I loooooooove coffee flavoured things so when you say that you can really taste the coffee in this, it makes it sounds extra amazing to me. This looks so decadent! I love coffee and I know I’d love this. Meryl, when I click on it I get the title and description, but I also get headings with arrows. When you click the arrows, the recipe parts drop down. oh wow i love anything with coffee and chocolate, and the recipe looks simple enough. this looks delicious, anna! Noticed that this recipe is by Joanne Chang, whose bakery in Boston, “Flour,” is a favorite of mine. I’m very excited about her cookbook, which is coming out this fall, I think. When I try your link, it doesn’t work for me. Only the title and description show up! Your link seems to be the same as mine. I’m glad to hear it’s a favorite at your house too! 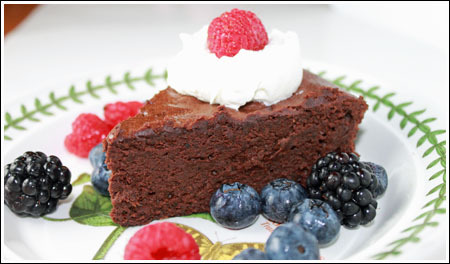 I LOVE this torte – I’ve made it many times! Gorgeous, looks delicious. You know I don’t do coffee, but would you just leave it out or replace that liquid with something? I’ve done a bundt cake once that called for coffee and used hot cocoa just so I wasn’t leaving out the liquid, but it was more than a cup. You know, I think it WOULD be good without the coffee. The recipe didn’t call for any vanilla, so you could add some of that instead. So is this similar to a flourless chocolate cake (only with a little flour?) I’ve never made one. I also don’t drink coffee, but this looks rich enough to go without the espresso as a very chocolate torte. Mmmm. I may have to give it a try. And that picture is really beautiful! Even though I’m not a coffee lover, this sounds delicious! I’m putting this on my To-Do list! WOW, thanks for the tip. Will make it over there today. Amy, Sprouts is having a “Berry Bonanza”. You can get 4 packs of assorted berries for $5. Oh my this sounds wonderful!! Will have to put it on my to bake list.